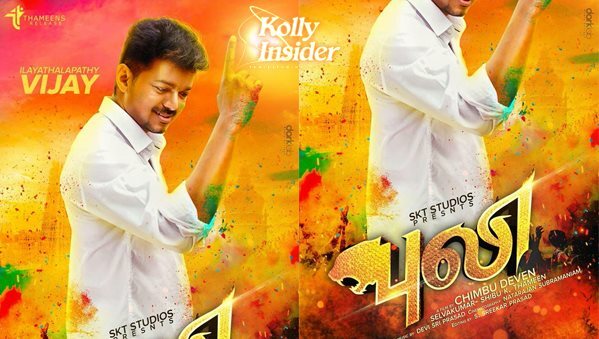 Actor Vijay's upcoming movie "Puli" is shaping up well and nearly 75% of the shooting is complete. Nandita Swetha completes her portions in upcoming movie "Puli". Vijay 58th movie ‘Puli’ is getting too fast towards completion and the final leg of shooting is being held at Angkor Wat Temple, the iconic 12th century Vishnu temple in Cambodia that boats of a wonderful historical factors of Tamil Kings and scripts. This location indeed has become the latest trend for the Kollywood to shoot there. Right now, the Puli team is busy shooting for two songs featuring Vijay-Hansika, Vijay-Shruthi Haasan. "We hope to shoot two songs between Vijay, Shruti Haasan and Hansika Motwani. The plan is to stay there for a couple of weeks and finish this important portion," a source from the film's unit told IANS. Originally the makers had planned to go to China to shoot the songs but dropped the idea due to the extremely cold conditions. After this schedule, the entire project comes to an end and the post-production works are simultaneously getting done indeed. The latest news is that the satellite rights of ‘Puli’ have been acquired by Jaya TV for a whopping price of Rs.22 Crores. Vijay's earlier movie 'Kaththi' was sold to Jaya TV too. These days makers wants to play safe by selling it to ruling party TV Channel to avoid release issues, worth to mention 'Thalaiva' sold to Sun TV and had issues releasing on time. Touted to be a fantasy-thriller, the film reportedly features Vijay in triples roles and one among them is set in ancient backdrops of the actor playing a commander of powerful kingdom ruled by a queen (played by Sri Devi) and Hansika Motwani as her daughter, a princess. Producers P.T. Selvakumar and Shibu K Thameen are planning to release ‘Puli’ on the 22nd of June which is the birthday of Illayathalapathy Vijay. The film will Be a historic treat to Vijay Fans.